On 30 August 1999, the people of East Timor voted to begin a process leading towards independence. Militias which had favoured integration with Indonesia subsequently launched a campaign of violence, looting and arson throughout the territory. Following strenuous diplomatic efforts to halt the violence, the Security Council authorized a multinational force, known as INTERFET, to restore peace and security, facilitate humanitarian assistance, and support the United Nations Transitional Administration in East Timor (UNTAET). On 23 February 2000, that Force completed its work and officially transferred its command to UNTAET, which is mandated to administer the territory during the transition to independence. 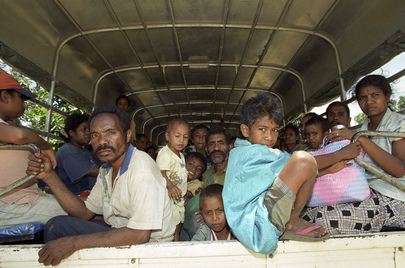 East Timorese refugees return from Atambua camp in West Timor. They will be screened by village chiefs and representatives of the National Council of Timorese Resistance (CNRT) to ensure that there are no militia members among them.